Gwern Gof Uchaf is a small, friendly site set on a 750 acre traditional working hill farm. 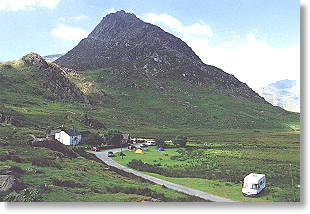 It is beautifully situated, right at the foot of the famous Tryfan peak, in the Snowdonia National Park. The site is run by the family who farm Tryfan itself. The long established campsite has offered excellent access to the mountains for many years, and is an ideal base for a walking or climbing holiday. The site now includes a new shower block and washroom, the use of which is included in the price of the pitch. The Plas y Brenin Centre is located about 2 miles away offering instruction in all outdoor activities including canoeing, climbing etc. The Zip World Velocity attraction is just down the valley at the Penrhyn Slate Quarry. The Carneddau, Glyders and of course, Tryfan, provide fantastic walking direct from the campsite. It is also well located for many tourist attractions in North Wales. The campsite can be found easily. It is set back from the A5 between Bangor and Betws-y-Coed at the top of the Ogwen Valley. The campsite is signposted from the main road (do not confuse with the neighbouring farm of Gwern Gof Isaf).